As if I needed an excuse to eat Tacos! But we do have Cinco De Mayo right around the corner, which is one of the best excuses. All Tacos and All Tequila, All Day- are you with me???? I have been traveling quite a bit the last few weeks and it has thrown off my facebook Live shows, but I am making up for it this Thursday! 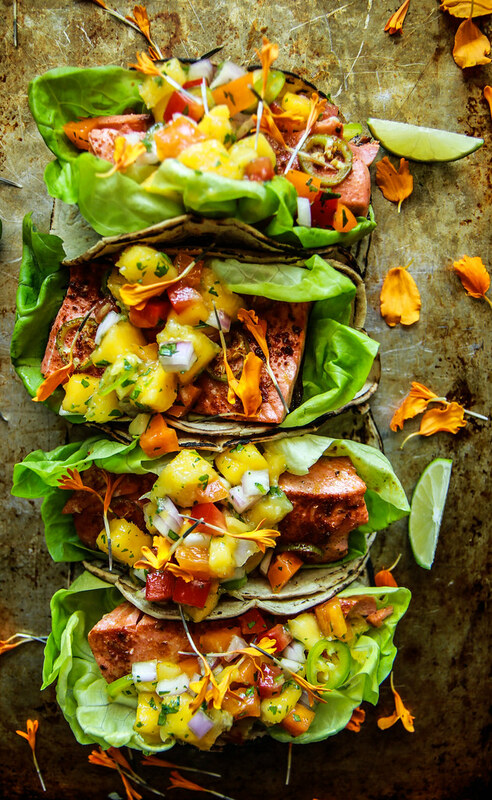 I am spicing things up too- it is not only going to be a Tequila induced Thirsty Thursday episode, but we will be having these tacos to go with the cocktails- please join me at 1pm PT for all that good stuff! In the mean time, here is a recent favorite taco combo. 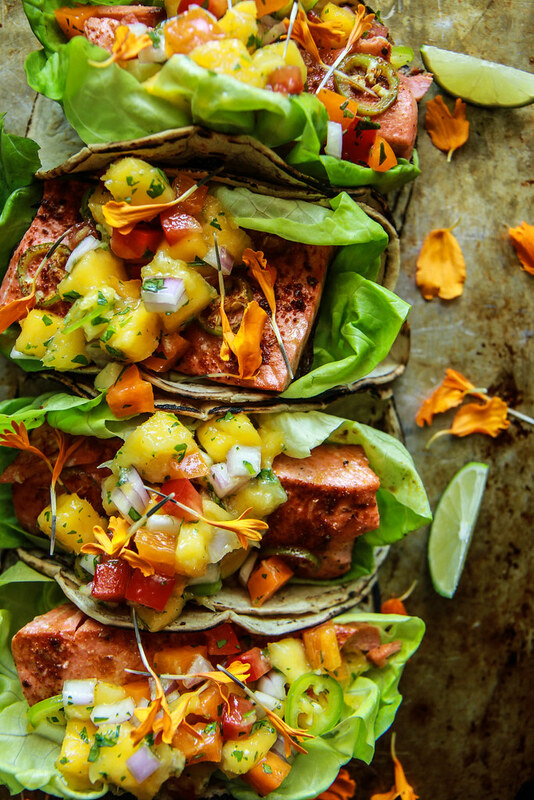 Spicy Chili Lime Salmon, wrapped in a toasty corn tortilla with a little tender butter lettuce, a little creamy avocado and a big old heaping spoonful of sweet and spicy and crunchy and limey Mango salsa. It is such an awesome combo, and whether you want to make these for friends on Cinco De Mayo, or your family on any day of the week- these will be a great weeknight addition to the dinner rotation this coming summer! Enjoy! Combine all of the ingredients in a medium sized bowl and season to taste with kosher salt. Set aside (this can be made hours ahead of time and kept in the refrigerator. Place the salmon on a sheet pan, preferably covered in a piece of parchment or foil. Drizzle the salmon with the 2 tablespoons of olive oil and then sprinkle with the limes zest. Take a rasp or fine grater and grate the jalapeno over the fish as well. Finally squeeze the juice of one lime over the fish. Generously season with kosher salt. When the oven is hot, place the fish in the oven and roast for 10 minutes. While the fish is cooking, heat the tortillas in a dry pan over high heat, or briefly heat over an open gas flame using kitchen tongs. Store the hot, slightly charred tortillas in a piece of tin foil to keep hot while the fish finishes cooking. When the fish is ready, take each tortilla and place a small leaf of butter lettuce inside and then top with a piece of salmon. Garnish with a wedge of avocado and a large spoonful of the mango salsa and serve hot. Repeat with the remaining salmon. Oh my this looks good! Can’t wait to try it. Heather, for a few months now, I have been unable to print your recipes from your “Print Recipe” button. I am on Mac. Perhaps I changed some setting on Java or other? Do you have any suggestions to remedy this? Now these are some nice tacos! OMG! This looks so great!!! I can’t wait to get my hands on these gorgeous tacos! What a beautiful and fresh dish! Is that nasturtium petals sprinkled on the top? Not in the ingredient list or the recipe….?? Hi Alice- they are marigold petals! Hi Sabrina, it’s a reference to the spicy jalapeno or fresno chili.